Another one of Eric Harris's Doom WAD levels: realdeth.wad. The Columbine High School shooting occurred on April 20th, 1999, and killed 13 people while injuring many more. The two perpetrators were two seniors, Eric Harris and Dylan Klebold. 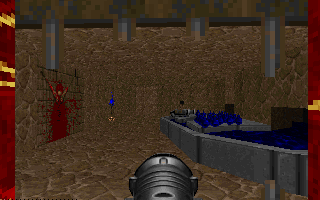 Before the shootings occurred, Harris, an avid player of the video game Doom, was known to a few to create various Doom WADs (WAD being the default package of files for the game), many of which can be found here. There were numerous WADs he shared with his friends, including THRASHER.WAD, REALDETH.WAD, and more. According to page 7043 of the 11,000 page Columbine Report, Eric Harris was quoted as saying that he had created "a level in Doom that was Columbine High School," leading some to falsely believe that Harris and Klebold were practicing the shooting in the WAD. According to some, "realdoom.wad" is rumored to be the WAD in question. No evidence has surfaced as of yet to confirm this. Even if it was, the WAD in question is currently lost and cannot be downloaded.